Quite frankly, I never thought that battery capacity will be the star feature in a high end Android smartphone, but, given my experience with a number of top notch devices from the past year, it makes perfect sense. After all, I witnessed several Android top dogs with massive spec sheets display battery performance, which puts their daily usability in question, thus forcing me to walk around with a charger in my pocket. The DROID RAZR MAXX is clearly aimed at this painful issue. As you know, the subject of this feature is a Verizon Wireless exclusive, LTE/CDMA device, which is why you won’t find it in the usual review section of GSMArena.com. The RAZR MAXX however, is easily among the most significant devices to launch in quite a while, thanks to its 3300 mAh battery on board and the massive shift in usability which it represents. So go ahead and enjoy this short version of our trademark reviews. As always, we’ll to get things going by taking a look at the handset’s key features. The list get completed with the usual full connectivity set and Motorola’s exclusive software tricks. It is easy to notice that the battery is the biggest highlight above – we’ve seen the rest of the specifications in the DROID RAZR before. Below are some of the features of the Motorola DROID RAZR MAXX, which we found to be… less likable. Motorola have threaded carefully with the DROID RAZR MAXX in order not to alienate the users, who bought the original DROID RAZR. While the newer model looks clearly like the better option from the two, the owners of the older incarnation will still have bragging rights as it is thinner and more elegant. It also comes with several color options. The Motorola DROID RAZR MAXX comes in a compact, square-ish box. Inside, you will find a charger and several booklets. The 16GB microSD card is already inserted in the device. Given the phone’s battery prowess and serious multimedia capabilities, it would have been great if a pair of headphones was part of the retail bundle. Unfortunately, you will have to get one on your own in this case. Design wise, the DROID RAZR MAXX is completely identical with the regular DROID RAZR. The same octagonal shape is present, along with the same design patterns from the older model. Like I mentioned above, you can only tell the RAZR MAXX apart if you take a look at the device’s sides. Build quality is also superb. The RAZR MAXX is put together from the same blend of Kevlar, Corning Gorilla Glass, and metal as its predecessor. I guess, only a user of the likes of Vertu or Mobiado might find something to frown about the build quality here. The Motorola DROID RAZR MAXX’s measures are 130.7 x 68.9 x 8.9mm. This is only a 2mm gain in thickness over the regular DROID RAZR – more than acceptable, given the massive battery stuffed inside the smartphone. The handset’s weight is 145 grams – also quite commendable given its hardware. The 4.3″ qHD screen of the handset looks good, has great outdoor visibility, and, like all Super AMOLEDs, great contrast. The only minor grievance I have here is the PenTile nature of the unit. A Samsung Galaxy S II display for example, looks sharper, despite its lower resolution. The 3300 mAh battery is the DROID RAZR MAXX’s greatest highlight. The smartphone achieved a total rating of 61h in our traditional battery test – a result which simply blew all competition out of the water. You can find out the full breakdown of the device’s battery test here. Handling the DROID RAZR MAXX is a real pleasure. The materials used in its making certainly help here. The same can be said about the extra 2mm in the smartphone’s waistline. It is now much less prone to drops. The much talked about camera hump on the back of the original is almost leveled out too. Unsurprisingly, the hardware of the RAZR MAXX didn’t disappoint, while its battery is downright amazing. It is now time for a closer look at the software of the device. 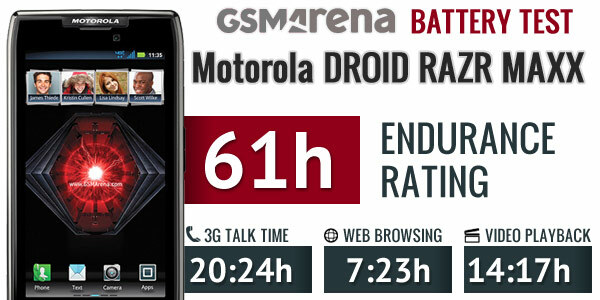 At its launch a couple of weeks ago, the Motorola DROID RAZR MAXX featured Android 2.3.5 Gingerbread out of the box. You can see it in action below. Right before we were about to publish this feature, the handset received an OTA update to Android 2.3.6. While not revolutionary, it brought some welcome changes to the RAZR MAXX. They include several changed icons, including an updated device settings interface, to go with the usual performance tweaks. Since this is a short version of our usual reviews, I am not going to dig deeply into the software of the RAZR MAXX. Dressed in Motorola’s own UI, it is no different than the software of the global version of the RAZR, which we’ve covered extensively, save for the obscene amount of preloaded bloatware from Verizon on board. The latter has questionable functionality and cannot be removed out of the box. Motorola is hardly to blame here, as the preloaded apps are subject to negotiation with Verizon Wireless. An option to remove them however, would have been fantastic. While the benchmark results of the Motorola DROID RAZR MAXX are certainly not eye popping, I would not qualify them as lowly either. The DROID did well in some of the tests, and placed itself in the middle of the pack in others. Below you will find some of the results. It is well known by now that benchmark results often have little in common with the real life experience, which a device offers. The DROID RAZR MAXX is yet another example. To put it simply – the device feels extremely fast and responsive. You will be really hard pressed to find even the slightest presence of lag, regardless of what task you throw the RAZR MAXX’s way. The camera of the Motorola DROID RAZR MAXX is an 8MP autofocus unit with LED flash – right in line with the top offerings from the competitors. The interface is simple and intuitive. You can start the camera straight from the lock screen with a swiping gesture. I was also pleasantly surprised by the speed with which it captured photos. The pictures which the DROID RAZR MAXX took came out great. They have great contrast, nice metering and dynamic range for a phone camera shots, along with top-of-the-line resolved detail and pleasant colors. Check out a few of samples below. The camcorder of the RAZR MAXX can capture full HD videos at 30fps. Its interface is no different from the still camera one. Video quality is really nice with plenty of detail and good colors. On the negative side, there’s no continuous auto focus, the camera focuses before the start of recording. Also, the automatic exposure does its job quite noticeably since the changes in exposure are anything but smooth. Below you will find a couple of video samples from DROID RAZR MAXX’s camera. In 1080p mode the bitrate is about 15Mbps, the audio is stereo, encoded at about 128Kbps. Videos are recorded in MP4 format and a minute of video turns up a filesize of about 110MB. In 720p mode the bitrate is about 10Mbps, the audio is stereo, encoded, again, at about 128Kbps. Videos are recorded in MP4 format and a minute of video turns up a filesize of about 60MB. 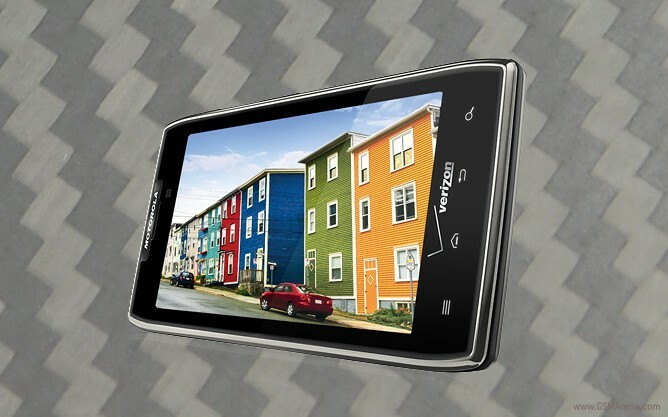 Just like its predecessor, the DROID RAZR MAXX offers you more connectivity options than you can possibly need. Along with the usual Wi-Fi, Bluetooth, etc., the RAZR MAXX can connect to Motorola’s lapdocks, and transform itself into a seriously productive notebook. Motorola DROID RAZR MAXX does everything a high-end Android smartphone should do. Except, it actually has the battery to keep going and last you more than a day. The sole presence of that 3300 mAh battery on board should be enough to entice customers aplenty. You will be hard pressed to find an alternative to the RAZR MAXX. Perhaps a competitor with an aftermarket extended battery? This could work, so long as you are comfortable with the fact that your phone will end up being a serious eyesore. The RAZR MAXX however, does not compromise on its looks or ergonomics. It is therefore, one of the easiest phones to recommend in a long, long time.